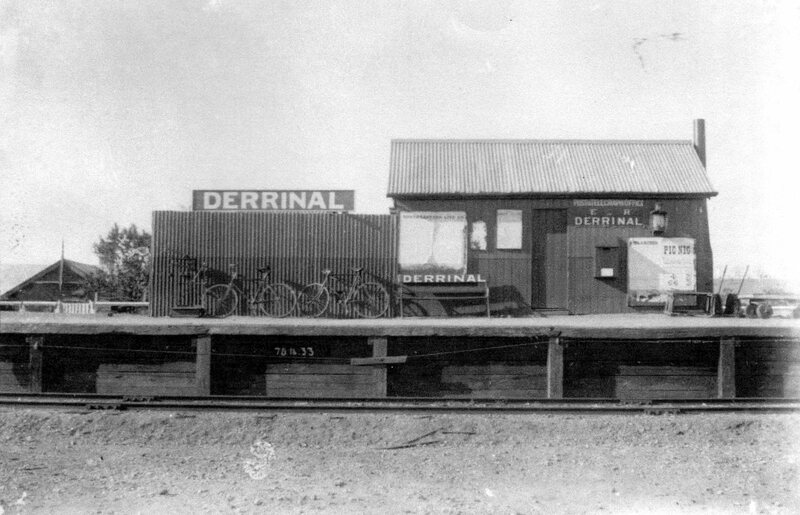 The former Wallan to Bendigo railway had trains carrying passengers and goods for most of the 70 years for the Bendigo – Heathcote section, between 1888 and 1958. The O’Keefe Rail Trail has been located on sections of this former railway reserve since 1992. 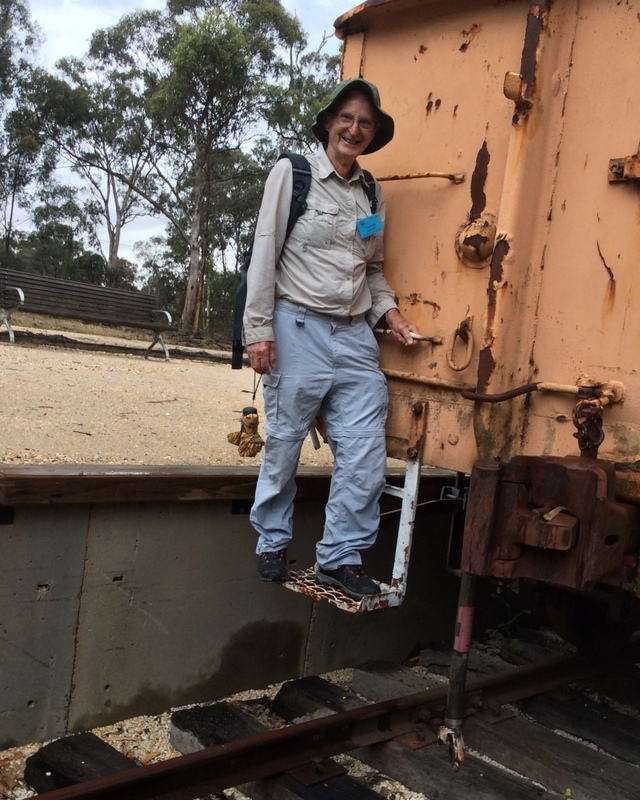 An initiative of the Friends of the Bendigo-Kilmore Rail Trail community group was to create another link between the rail trail and that former railway, with an historic static display of a 20th century railway wagon. The location for this display was to be the former Axedale Railway Station site, where a replica platform had recently been constructed by the group. Not only is this an historic link with a past means of transport, it is also expected to be an educational opportunity for school children and younger adults. 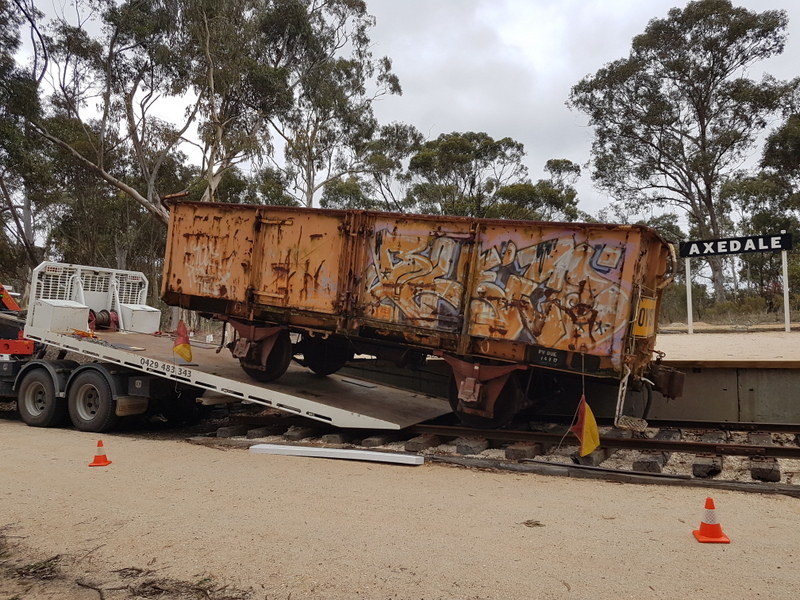 This project has just recently taken another step forward from the planning stage, with the delivery of a former Victorian Railways ‘GY’ 4-wheel wagon. Also as an added historic link to the Bendigo area, this particular wagon was one of a number manufactured at the VR North Bendigo Railway Workshops between 1955 and 1957. The transportation of the wagon to Axedale was made possible by a community grant provided by the Fosterville Gold Mine and Kirkland Lake Gold. This grant has been very much appreciated by the group, as was the assistance provided by local transport company A2B Move It. The project’s next stage will see the refurbishment of the wagon for public display. A community grant will help to have an historic railway wagon return to Axedale, where steam loco hauled goods trains were once loaded and unloaded as an important means of transport. 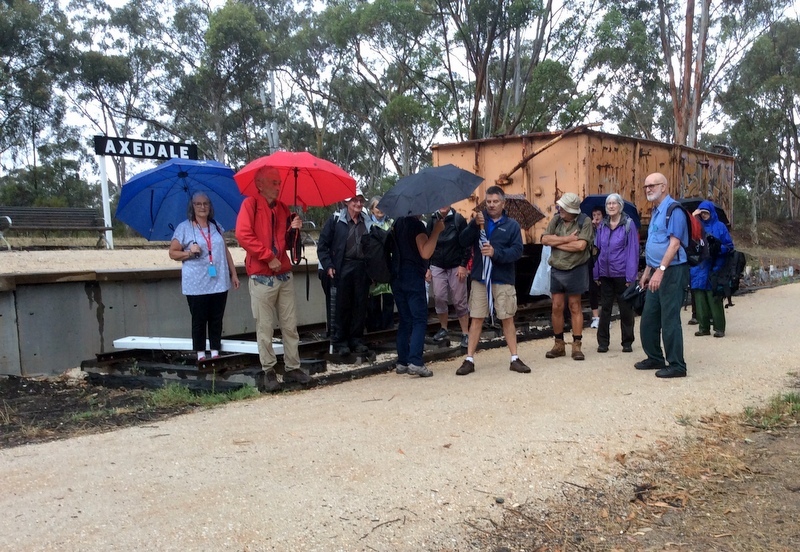 Fosterville Gold Mine and Kirkland Lake Gold 2018 Community Grant program has awarded the Friends of the Bendigo-Kilmore Rail Trail a $2000 grant, which will help the project relocating an original Victorian Railways ‘GY’ 4-wheel wagon to Axedale. 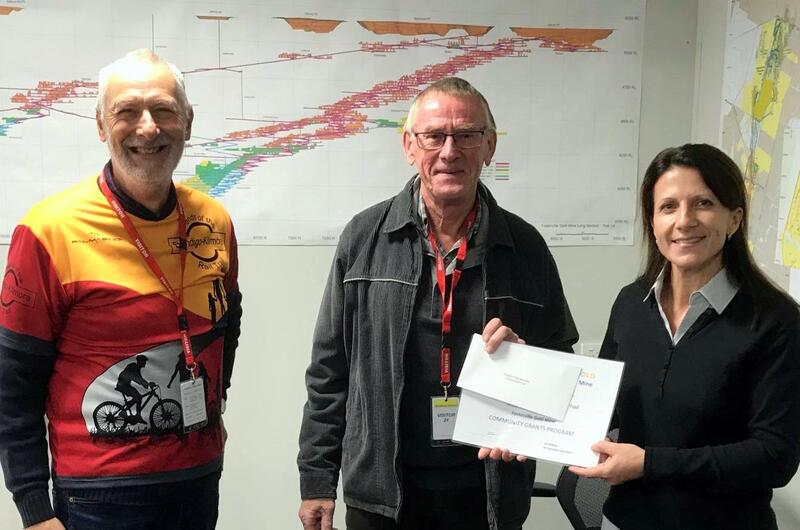 Fosterville Gold Mine Trudi Jackson presents grant to Friends members Rob Nelson and Mal Ward. This historic static display area is the location of the original Axedale Railway Station, an additional point of interest for O’Keefe Rail Trail users…and perhaps the cause of a ‘selfie’ or two to be taken! The Friends community group plan to refurbish the wagon for public display, and as an educational location for school students. Kirkland Lake Gold is thanked for supporting this community initiative, another instance of business companies assisting the O’Keefe Rail Trail’s development. Looking for something to do after arriving in Axedale, perhaps before heading to the Axedale Tavern or Store for lunch, or a coffee n cake, or some refreshment before heading back on the O’Keefe Rail Trail? 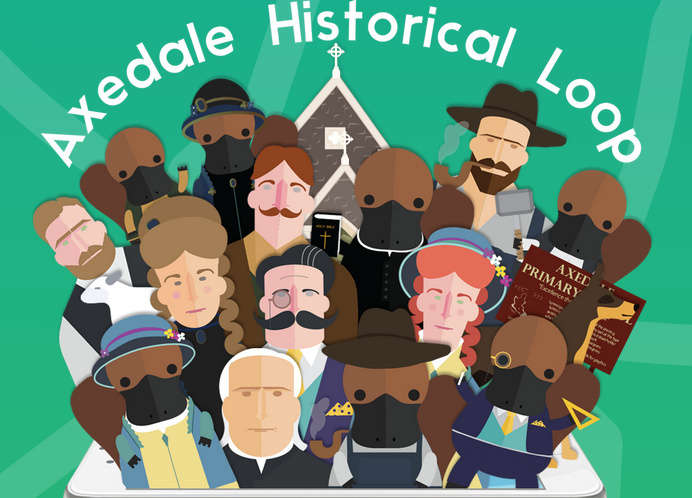 The Axedale Historical Trail is there to inform, to enable you to immerse yourself back in another time, to help understand what people may have done in Axedale in the late 19th and early 20th centuries. To help with your exploring this local trail, there is also a smart device Axedale Historical Trail app that can be downloaded. This app can send you back into a different period of time, with slower transport, ladies in flowing dresses, yet often challenging times for many. So enjoy the experience………….while your family and friends go back in history! One Lost ‘Concrete Solder’ returns! The O’Keefe Rail Trail’s ‘75 mile’ concrete post that was stolen from the trail has been found! As one of the replica railway marker post installed beside the trail on the former railway alignment, this one was found to be missing. 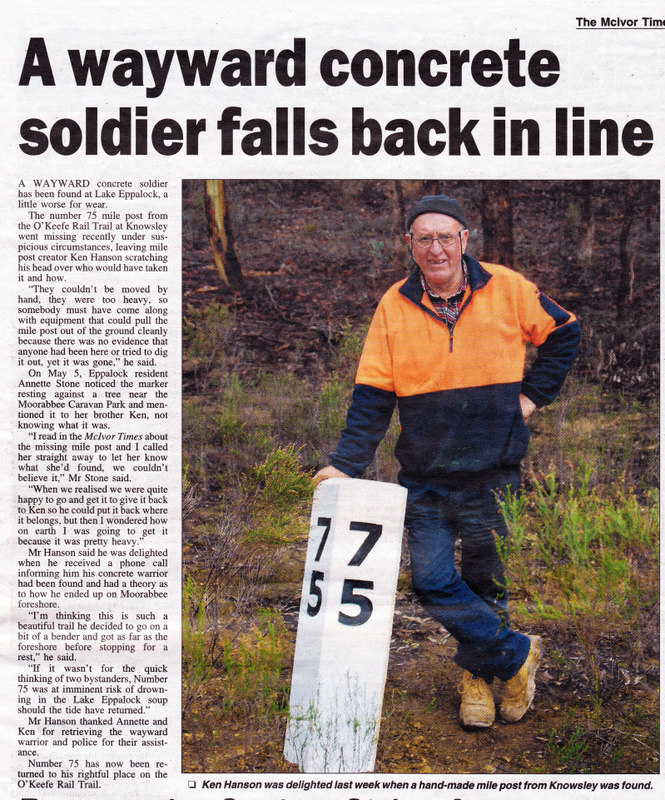 Media coverage of this unfortunate situation assisted to help recover one of Friends of the Bendigo-Kilmore Rail Trail member Ken Hanson’s ‘concrete soldiers’. 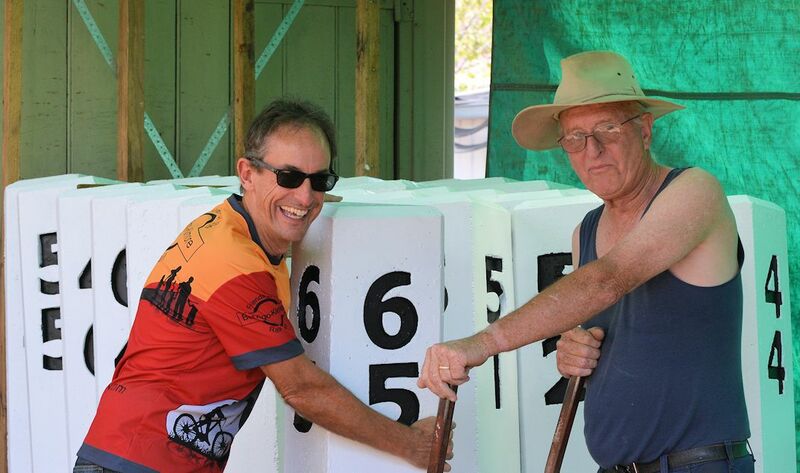 A local district resident Annette Stone found the post at Lake Eppalock, and her brother Ken Stone realised what it was after reading an article in The McIvor Times. With assistance from the Heathcote police, the post was returned to the Friends of the Bendigo-Kilmore Rail Trail. Ken Hanson then repaired the damaged post and a working bee returned the post to the original location beside the rail trail, to be enjoyed by an increasing number of trail users. One of the stories heard at the time was that Ken must have put a special chemical additive into the concrete when initially pouring them, which could make the posts ‘too hot to handle’ if stolen!! The sleepy hamlet of Knowsley has been highlighted yet again by the O’Keefe Rail Trail. 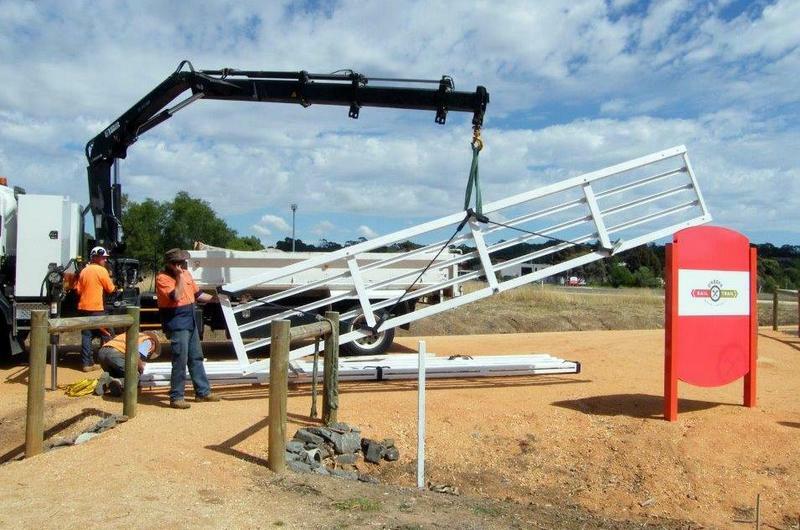 Back in April-May 2015, the last sections to be constructed for the trail’s extension would see Knowsley as the focal point, the final link in the continuous trail between Bendigo and Heathcote. In April 2016, two new milestones have again focused on Knowsley. 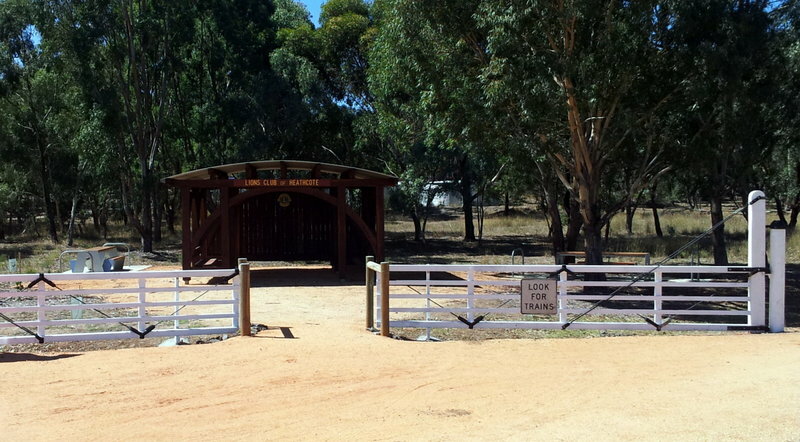 The Friends of the Bendigo-Kilmore Rail Trail group have been adding a number of facilities and features along the O’Keefe Rail Trail, some linking the trail to its former railway heritage. Two such features have been the replica railway marker posts, often known as ‘mile posts’, and replica railway station name boards. The marker posts originally indicated the railway distance in miles from Melbourne, and the name boards stated the name of a particular railway station. 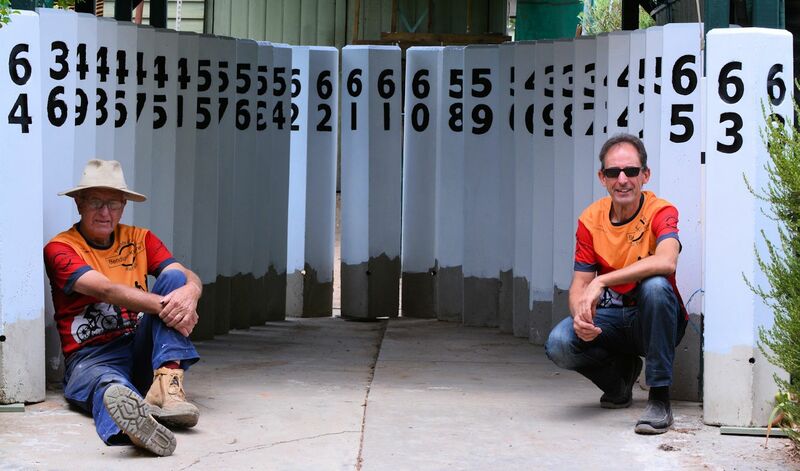 Wednesday 13 April 2016 saw Knowsley receive the last of the Friends’ manufactured concrete marker posts, number ‘83’, placed on the O’Keefe Rail Trail. These concrete posts have been ‘planted’ at every mile distance, or as near as possible to the original, between Heathcote and North Bendigo. 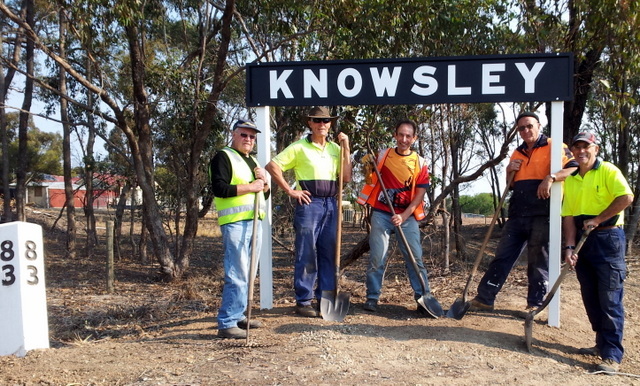 Also the eighth and last station name board to be placed along the trail between Bendigo and Heathcote, ‘Knowsley’, was installed to highlight the once fully functional railway station. While unable to place the name board directly on the former platform site, the sign is located right on the railway line alignment where a railway ‘cattle grid’ was once located. With those having an interest in railway history being attracted to rail trails, or for other trail users learning about the former transport links, these historical connections with the past are bound to create additional interest for what is becoming a popular walking and cycling tourist attraction. Slim Tall Numbered Creations in Concrete! All lined up in a row, starkly painted white, yet with nowhere to go! What could these items be… futuristic headstones or links into history, totem poles of worship, maybe seafaring markers, mysterious sequenced numbers (seen from many angles), or perhaps a measure of human ingenuity from a past industrial age? Are they modern representation of artefacts found from a lost ancient civilisation, like unexplained icons similar to those carved moai figures found on Easter Island? Could they be part of an upcoming exhibition, by a little known local artist, at the Bendigo Art Gallery that is expected to draw large crowds into this city of culture! With over 70 of these items having been produced by Friends of the Bendigo-Kilmore Rail Trail’s ‘resident artist’ Ken Hanson, they have drawn quite a deal of interest when placed on public display.